Elite: Dangerous’ aliens, once prone to terrifying yet ultimately peaceful encounters, have started reducing players’ ships to space dust. Of course you know, this means war. 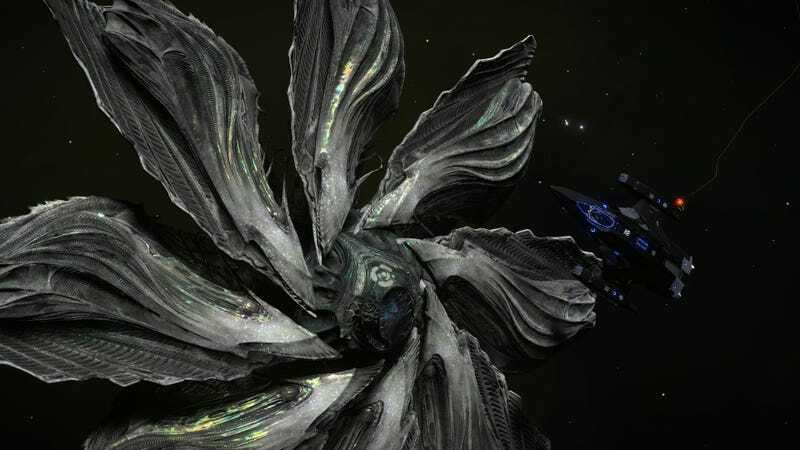 After two years of hints and intrigue, Elite: Dangerous’ aliens, the Thargoids, revealed themselves in all their flower-shaped, fleshy glory earlier this year. First contact was peaceful, albeit tense. Players’ ships went haywire in the shadow of these hulking monstrosities, but when death seemed imminent, aliens would just scan player ships and be on their way. Think strength in numbers might solve the problem? Think again. 21 players tried to bring down a Thargoid ship at once. None of them made it back. Players have also found that when they try to scan Thargoid ships, they receive a series of strange codes. There’s now an ongoing effort to decrypt them in hopes of figuring out how to avoid getting slaughtered by diabolical space pinwheels. The strangest encounter happened to a player named Nat, who claims that they somehow got a Thargoid ship to “shut down,” at which point they were able to get in close and observe it. They didn’t find anything that explains why the Thargoids are suddenly going on the offensive or how to fight them. Eventually, the ship powered back up and left. A player named Commander Badalloc has put together a guide on how to encounter a Thargoid, if you’d like to try for yourself. Remember to make sure your valuables are accounted for beforehand, though. And probably make peace with your god, too.